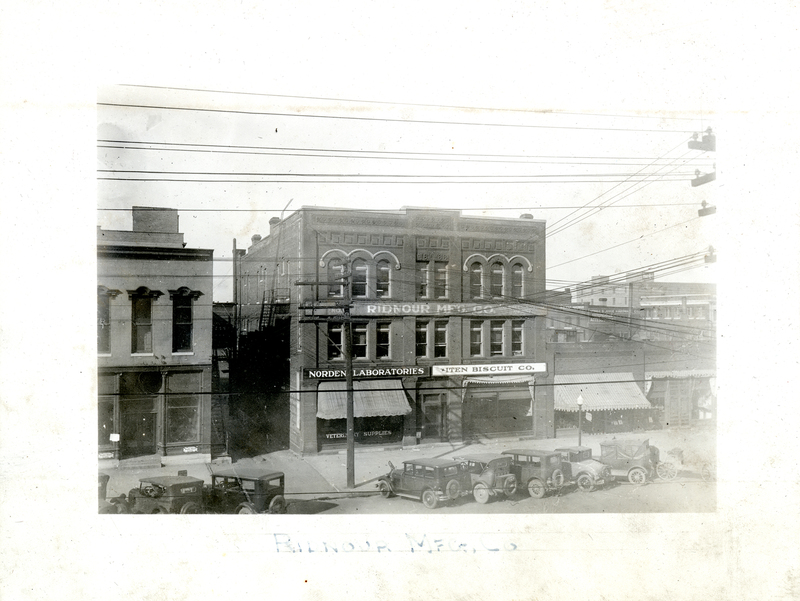 The Burr & Muir Block is one of the very few intact examples of the substantial commercial buildings that lined 9th Street before the turn of the century (see also building #42). D. D. Muir and his partner Carlos C. Burr, a Lincoln real estate dealer, attorney, and one-time mayor, constructed their block in 1888 from designs by James Tyler, one of Lincoln's first architects. Tyler came to Lincoln around 1874 to supervise construction of the first U. S. Post Office and Courthouse ("Old City Hall"). Burr & Muir Block is one of Tyler's best-preserved early designs, as well as being the oldest Haymarket building for which the architect is known. It displays elements of the Romanesque Revival style in its squat, carved stone capitals above the ground floor piers and the round-headed third floor windows. The arched decoration above those windows is metal. Note also the rounded bricks used at the corners of the facade. A date stone above the third floor central windows, illegible today, clearly reads "1888" in early photographs. Built as a rental property, the Burr & Muir Block has had variety of occupants, including Norden Laboratories, which grew into an international leader in research and production of veterinary medicines, before being purchased by even larger pharmaceutical companies. Norden moved to this building eight years after the company's founding in 1919 and occupied the whole structure by the mid-1930s. The "Lincoln Underground" restaurant, which opened in the basement in 1972, anticipated the beginnings of the Haymarket District's substantial redevelopment by more than a decade. Return to Q Street to continue the tour, proceeding west (left) on the south side of the street. West of Barry’s (235 North 9th Street) is a mid-20th century, red-brick warehouse now used as a parking structure. Next west is a narrow site that formerly stood vacant, except for a small building at the south end against the alley. In 1987 a faux façade was constructed at the north end of the property to enclose a beer garden for the bar that operated in the small building. In 2001, the space was remodeled for a restaurant by adding a roof and reconstructing the façade with two entries, one for the restaurant on the east and the second for the theater on the upper floor of 803 Q Street.